Once you save a draft of your event or make your event live, you have the ability to add in and manage more advanced features through the Customize link. On this page you can create a custom URL for your event, enable information gathering about your attendees, control ticket numbering, edit your page layout, add waivers or pledge forms (if necessary for your event), select buyer payment options, and control privacy settings. To access the Customize screen, first click the Manage Events link at the top of the page. When you’re on the Manage Events page, you will see a list of your events. Click the More link on the right side of the page in the row with the event you would like to customize. A menu will appear with a list of options. Click Customize. From the Manage Events page, you can also access the Customize page by clicking the name of your event, and then clicking the Customize button on the menu bar at the top of the page. If you would like to gather information about your attendees, you can control the type of information you acquire by using the Attendee Management screen. When you click the checkbox next to “Enable Attendee Information Management,” the page will expand to display customizable options regarding the data you’d like to collect. First you will decide when attendees will enter their information, either before or after checkout, by selecting the radio button next to either Before Checkout or After Checkout. The next step is to decide what information will be requested and/or required. You are able to collect First Name, Last Name, Organization Name, Email Address, Phone, and Mailing Address. Select the check box under the Include column for any of the options you wish to request from attendees. If you would like any of the items to be required, check the boxes under both the Include field and the Required field. You can also define custom questions to ask attendees by clicking the +Add Custom Question button. Questions can ask things such as which dinner options a guest would prefer or what their t-shirt size is. You can add as many custom questions as you like, and you can decide whether or not to require them by checking or unchecking the box under the Required column. You also have the option to choose whether these questions will have a text field, radio button options, or a dropdown menu of choices. Once you have set your parameters, you are able to set up email notifications for buyers who have not completed their attendee information. To do this, check the box next to “Send an email notification to buyers who have not completed their attendee information.” You are then able to decide when the email will be sent by checking the box next to your preferred time(s). Click here to view a sample event that uses Attendee Information. 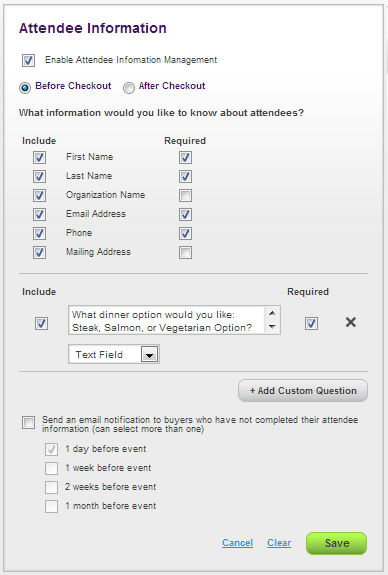 Click here to view a sample event that uses Attendee Information with Custom Questions. The Ticket Numbering link allows you to customize your tickets by choosing how they will be numbered. You can pick standard numbering, or you can use custom numbering to create highly specific tickets for your event. To customize your ticket number, select the radio button next to Custom. The screen will expand to display a variety of options. Ticket numbers must be 15 characters or less. Customizable options include choosing a Starting Number, Increment Number, # of Leading Zeros, Prefix, Separator, and Suffix. 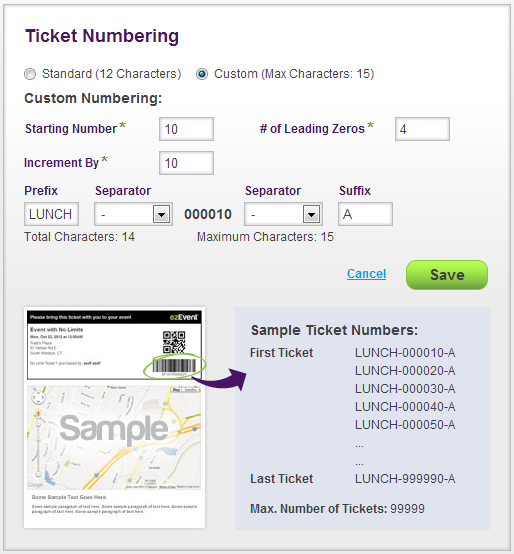 As you customize your numbering you can preview how the numbering will be displayed on the ticket in the Sample Ticket Numbers box. When you are happy with your numbering, click the green Save button to put your changes into effect. 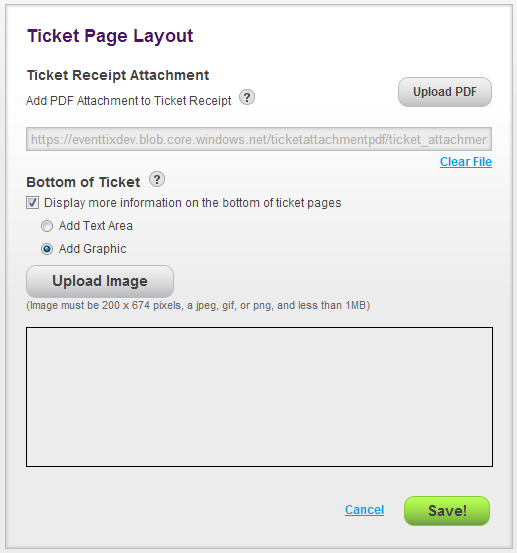 On this page you can customize the layout of tickets and upload an Adobe PDF file that the ticket buyer can download after checkout. To upload a PDF, click the Upload PDF button and open the file you want to upload. When the file is uploaded, you will see a link appear in the previously empty box under the Upload PDF button. If you decide you do not want to use the file, or if you want to upload a different file, click the Clear File link. A map of your event location is normally displayed at the bottom of your tickets. If you would like to display additional information on your tickets, check the box next to “Display more information on the bottom of ticket pages.” Choosing this option makes the map smaller and displays either a custom text area that you define or a graphic at the bottom of the page. The default option is Add Text Area. To do so, enter your text in the provided box. Using the Rich-Text Formatting (RTF) toolbar, you are able to add basic formatting to the text, such as Bold, Italicize, Underline, Fonts and Text Size, Text Color, and Background Color. If you decide you need to remove formatting that you’ve added to your text, highlight the text you want to remove the formatting from and then click the eraser icon on the toolbar. If you would like to upload a graphic instead of text, select the radio button next to Add Graphic. Click the Upload Image button and open the graphic file you would like to upload. The image must be 200x674 pixels, a jpeg, gif, or png, and less than 1MB. When you are satisfied with your selections, click the green Save! button. The selection you make will be displayed on all of your tickets. Click here to view a sample event that has a custom Ticket Page Layout. Some events, such as fitness events at gyms, may require attendees to sign a waiver. 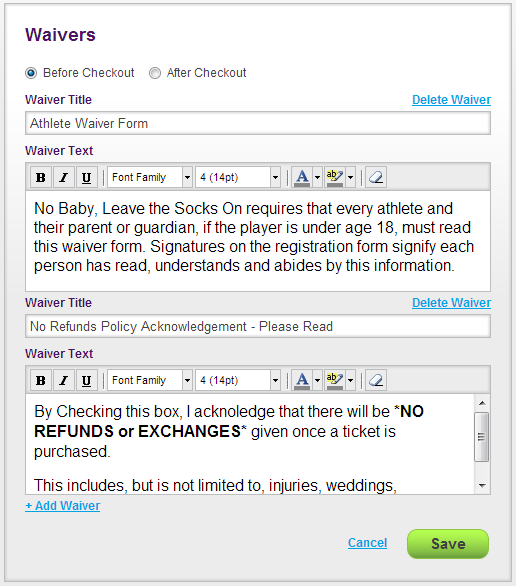 The Waivers link allows you to create unlimited event waivers and even have multiple waivers for different purposes. To create a waiver, click the +Add Waiver link. You can choose when attendees will sign the waiver, either before or after checkout, by selecting the radio button next to Before Checkout or After Checkout. Next you will enter in the Waiver Title and Waiver Text in the provided text boxes. Using the Rich-Text Formatting toolbar, you are able to add basic formatting to the Waiver Text, such as Bold, Italicize, Underline, Fonts and Text Size, Text Color, and Background Color. If you decide you need to remove formatting that you’ve added to your text, highlight the text you want to remove the formatting from and then click the eraser icon on the toolbar. When you are happy with the Waiver Text, click the Save button. Attendees will be prompted to electronically sign the waiver at the time you designated (before or after checkout). If you would like to create another waiver, click the +Add Waiver link and repeat the process. Click here to view a sample event that uses Waivers. Events such as walk-a-thons and read-a-thons often require a pledge form so that event participants can keep track of the people who are pledging money to support them. 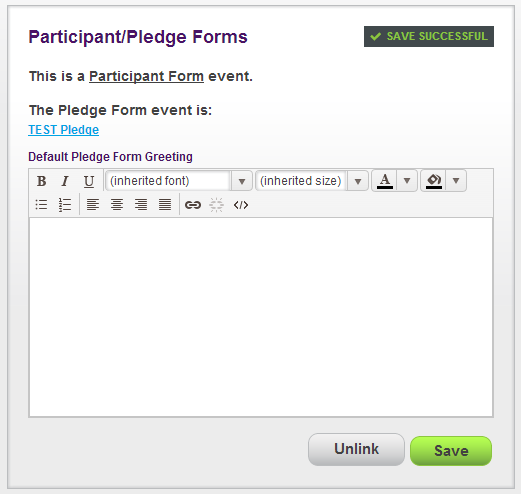 The Participant/Pledge Forms page allows you to create forms that make tracking pledges easy! When you get to this page, it is assumed that the event you’re working on is the Participant Event that you will sell tickets to. You are then able to select an existing event or create a new event that will be the Pledge Event. If you have already created a Pledge Event page, you can select it from the dropdown box to the right of “Choose an Existing Event.” The dropdown box will contain every event you have created that is in either Live or Draft status. Once you select the event, click the green Save button to link it to your Participant Event. If you have not created a separate Pledge Page, click the green Create a New Event button. When you click the Create a New Event button it will automatically create a new event in the system. The new event will be a duplicate of the Participant Event, but the new event’s name will have the word “Pledge” at the end. If the original event has a Custom URL, the new event will have the same Custom URL, but with “-p” at the end. The new event will only have one Ticket Type. It will be called “Pledge Donation” and be a Donation Only (No Ticket) type. The new event will be Private and will not have any of the Participant Event’s other Customize Event options in place. No matter whether you selected an existing event from the dropdown menu or created the new event using the Create a New Event button, you will next be brought to the Participant Form page. The Default Pledge Form Greeting box can be filled in either on the Participant Event page or the Pledge Event page. This allows you to enter in a default greeting that will show up on the Pledge Event Checkout page if the participant does not change it after their own checkout. Using the RTF toolbar, you are able to add basic formatting to the Default Pledge Form Greeting text, such as Bold, Italicize, Underline, Fonts and Text Size, Text Color, and Background Color. When you’re happy with the text, click the green Save button. If you instead decide that you do not want to use the current Pledge Event, clicking the gray Unlink button will break the Participant/Pledge event link and take both links out of the program. Your data will be saved in the database in case you want to link your events back together. The Buyer Payment Options link allows the Event Organizer to select which type of payment options they will offer to buyers. The available options are: ezEvent®’s Merchant Account to process credit cards, PayPal, pay by check, pay by invoice, and pay at the door. If you’ve previously set payment options on another event and would like to offer the same options for the event you’re working on, select the event name from the dropdown box next to “Copy payment settings from event” and click the Copy button. If you’ve never set up payment options or would like to offer different options, you will need to select which payment types you would like to offer by checking off the box next to the appropriate option(s). By default, the payment option is set to ezEvent®’s Merchant Account. If you do not wish to offer credit cards as an option you can uncheck this box. If you do wish to use ezEvent®’s Merchant Account you will need to select a Delivery Method for your payment from the provided dropdown menu, complete Pay To information letting us know who to make your check out to, and fill in your Mailing Address so we know where to send the check. If you do not wish to use ezEvent®’s Merchant Account, but still want to offer credit card processing you can choose PayPal. If you choose PayPal, you will need to provide your email address so that we can access your PayPal account and automatically deduct paid ticket fees. 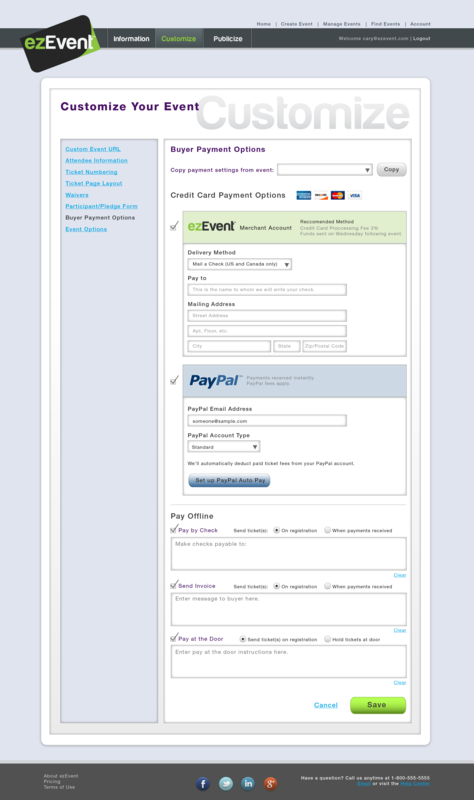 Please note that you can only choose ezEvent®’s Merchant Account or PayPal for credit card processing, not both. If you select one of the Pay Offline options, the radio buttons and text area for that option will become enabled. 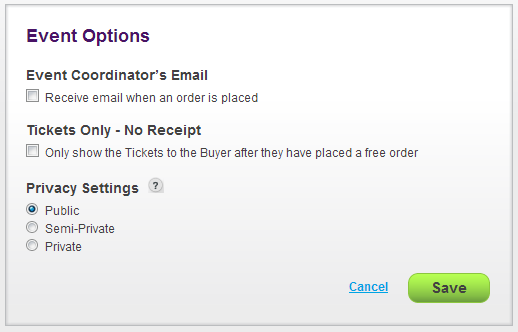 For each option, you can select when to send the tickets to a buyer by clicking the radio button next to either “On Registration” or “When payments received.” The provided text boxes are a space for you to include either a message or payment instructions that the buyer will receive when they purchase tickets. It’s important for you to fill out these areas thoroughly to ensure you receive your payment. Under each text area is a “clear” link. Clicking this link will clear the text in the corresponding instructions text area. When you are happy with your selections, click the green Save button. Public – Your event page can be found in all searches and displays by Event Start Date in Find Events. Semi-Private – Search queries must include either the exact zip code, city/state combo, or a complete, exact-match word from the Event’s title. These do not display while browsing all Events. Private – Can only be found by using the exact URL. Does not appear in searches or while browsing all Events.